With summer having come to an end, the cooler weather of Autumn has been a welcome change. I think Autumn has grown to become one of my favourite seasons, since here in Arizona it offers mild, sunny days and warm, temperate evenings. When October hit this year, I was really excited. 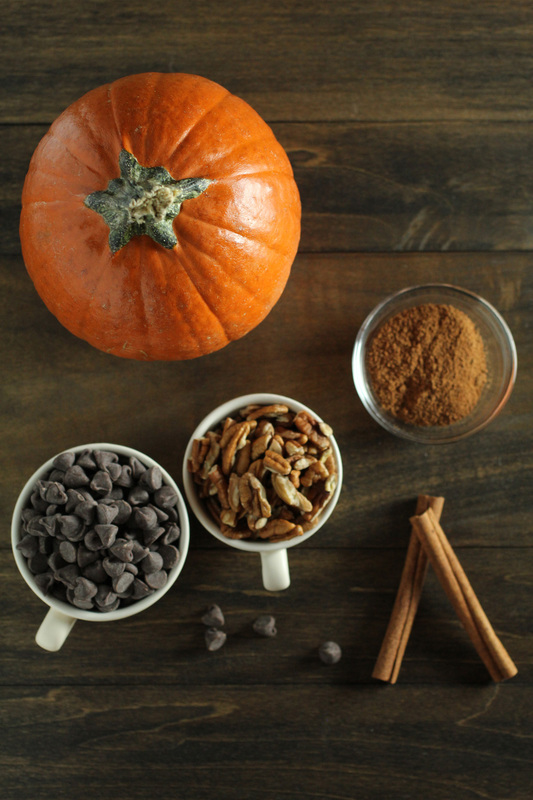 Seasonals were everywhere – pumpkin ales, spiced candles and lots of delicious baking goodies. I was intent on sharing the joy with Sister P and brother-in-law Mr. T when they came to visit, so being the master schedule-planner that I am, I figured we could squeeze in a pie-bake one late evening. By the time the pie was baked and cooled, it was well after 2 am. We were all very sleepy and tired, but the smell of freshly baked pie crust (thank you Maggie Beer, I love your sour cream pastry) mingling with pumpkin and spice was all too inviting to let us sleep… yes, we stayed up and we ate it. 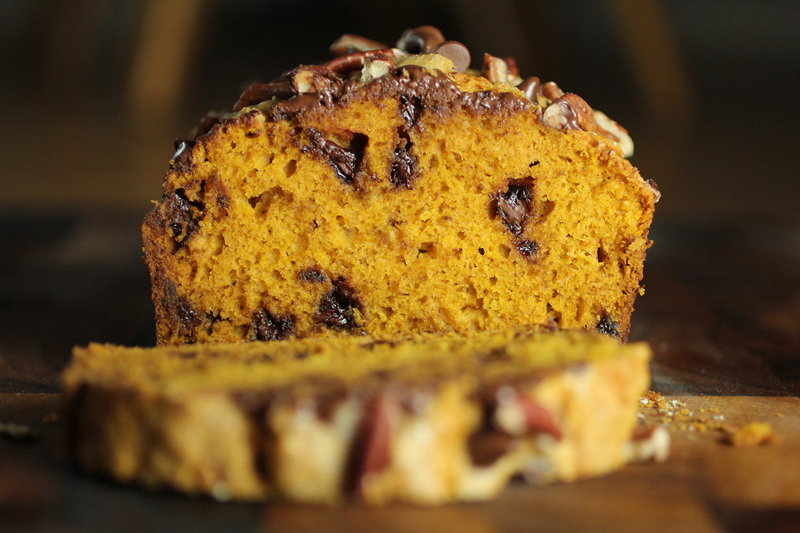 I wanted to share something special for Fall, and so here is a recipe that I learned to make from Mr. Pepper’s mum, Mama P. It’s a pumpkin and spice loaf which is sweet and moorish and freezes really well so that you can save it and sneak a slice any time you feel like a bit of a treat. 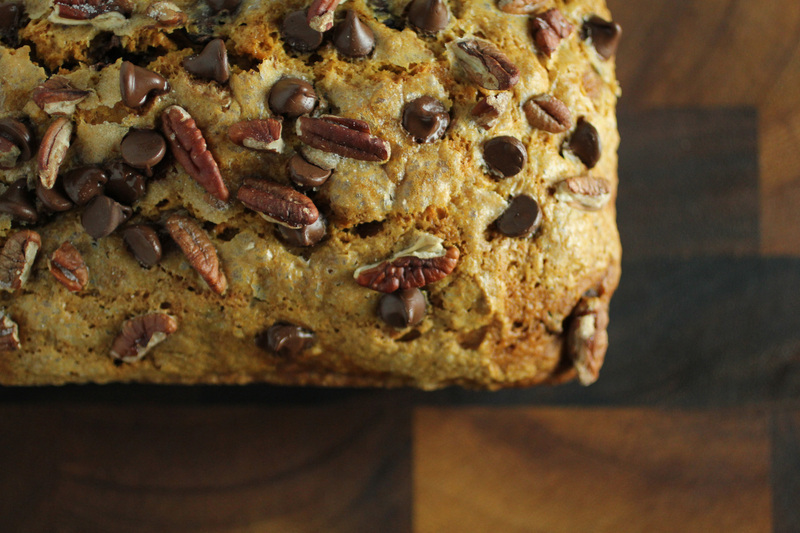 The pecan and sugar topping gives the loaf a wonderfully nutty and slightly crispy finish, and the chocolate chips… well, they’re chocolate chips, need I say more? Perfect with a cup of good coffee or a glass of milk. The only challenge you might find with this recipe is not eating it all at once! I hope you enjoy. Preheat oven to 350F. Grease a loaf pan with butter and dust lightly with plain flour. In a medium-sized bowl, combine flour, baking soda, salt and spices. Set aside. In a large bowl, cream the butter 1 cup of sugar with an electric mixer on medium speed until creamy and fluffy. Add the eggs to the butter and sugar, one at a time, beating well after each addition. Add the water and the pumpkin to the wet mixture, beating in with the electric mixer on low speed. Add the dry flour mixture to the wet pumpkin mixture, beating in with electric mixer on low speed until just combined. Pour the batter into the loaf pan and spread evenly with a spatula. Sprinkle the top of the loaf with the extra chocolate chips, sugar and pecans. Bake in the oven for 1 hour or until toothpick inserted into the centre comes out clean. You may need to rotate the pan in the middle of baking to ensure even browning. Cool on a cooling rack for 10 minutes and then turn out loaf onto rack to cool completely before slicing. Stores well in the freezer, wrapped in baking paper and foil, inside a zip lock freezer bag. I don’t know how long it stores because it gets eaten pretty quickly in this house!